NOTE: Ruby Tuesday no longer offers live jazz on a regular basis. This page will be updated if that changes. Ruby Tuesday (NOT THE CHAIN RESTAURANT OF THE SAME NAME) at the corner of Summit & 19th in Columbus, OH opened in August 1973 and has been providing some of the best live music in the city for years. The name Ruby Tuesday, of course, came from the song by the Rolling Stones about a seductive, illusive woman. On occasion they have jazz artists play here and its a great venue for hearing live music. A separate stage and seating area separates from the bar side of the building which provides a nice relaxing environment for watching live music. Ruby Tuesday at the corner of Summit & 19th in Columbus, OH opened without much fanfare in August 1973. All of us were very disappointed that the traffic to the nearby State Fair lent us very few customers. Supposedly one night, a limousine pulled up and parked on the other side of Summit Street. The occupant strode across three lanes of traffic and into Ruby Tuesday. Entering the game room, he approached the jukebox, deposited his quarter, and chose to hear “Jessica.” The man who played the song and one solitary game of pool and then left was Greg Allman. 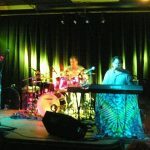 Some of the nationally known entertainers who have performed at Ruby Tuesday are Orangelake Drive from Detroit, Alexander Zonjic (the theme from Taxi artist), Grammy-nominee Rare Silk, Buckwheat Zydeco, and Jorma Kaukonen.